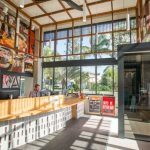 The redeveloped Byron Bay YHA in NSW, Australia has just opened with a design focus, unveiling three masterpieces by renowned Australian artists alongside a building extension that doubles capacity at this luxe ‘flash-packers’. Following a multi-million dollar makeover, the brand new reception area features an eye-catching artwork by local artist Robert Moore, whose paintings are found in many public galleries and used by iconic Aussie clothing label, Mambo. The piece riffs on the theme of ‘Paradise’ – a motif of Moore’s work – by welcoming guests to ‘Paradise YHA’. Popular Sydney street artist Mulga has also painted a vibrant beach-themed mural around the resort-style pool area. The new Byron Bay YHA is also breathing new life into vintage photo of 1960s surfer Horrie Budd at Kirra Beach, used for a wall skin (the man himself visiting the property to pay homage to the photographer who captured it, Mal Sutherland). The new extension has expanded the property’s capacity to 199 beds, across a mixture of multi-share and private rooms, with all new rooms featuring en-suite bathrooms and air-conditioning. Communal areas have also been redeveloped, providing spacious self-catering and lounge areas, with lush tropical vegetation surrounding the swimming pool. The property caters for all types of travellers from around the world, whether backpacking solo or travelling with friends or family. 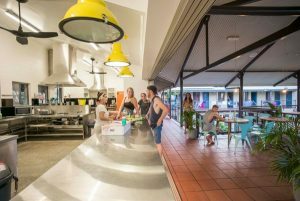 YHA is a not-for-profit membership based organisation, and part of the world’s largest budget accommodation network, Hostelling International, with over 4,000 properties in 60 countries including 70 unique places to stay in Australia.